Over the last month, I’ve been traveling quite a bit. I spent a week in Bali and have now been in Australia for the last two weeks. The 24 hours of flying from LA to Indonesia combined with the week in hot and humid Bali really took a toll on my body. I have been feeling pretty dehydrated and depleted and my body has definitely felt a little off. I was craving hydration and lots of greens so I took a trip to the local organic market here threw everything that sounded hydrating in my basket and shortly after new green smoothie was born! I do have to warn you though, this smoothie is pretty sour.. but I love anything sour. As a kid Sour neon gummy worms were basically one of my main food groups. The Cucumber, apple, and spinach are all super hydrating foods I combined them with lemon, lime and psyllium husk which help your body cleanse. I added Hydration Inner Beauty Boost by the Beauty Chef for an added dose of hydration. This stuff is legit. Not only does it hydrate your body, it’s also jam-packed with probiotics, prebiotics, electrolytes, minerals, and vitamins which support skin health and overall wellbeing. blend with ice and water! 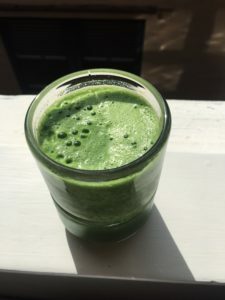 I hope this smoothie leaves you feeling hydrated and back on track!